Students in Brenda Coulombe’s HPE Grade 5 class watch Karl Giroux make a fire before students made their own fire in small groups. 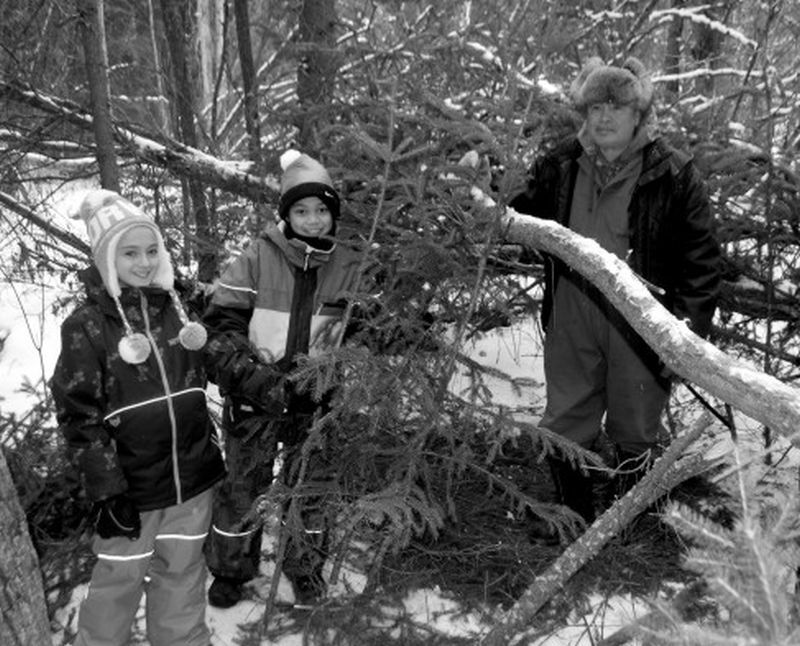 Midway through winter, Grade 5 students in two local schools got a hands-on lesson how to survive in the bush. 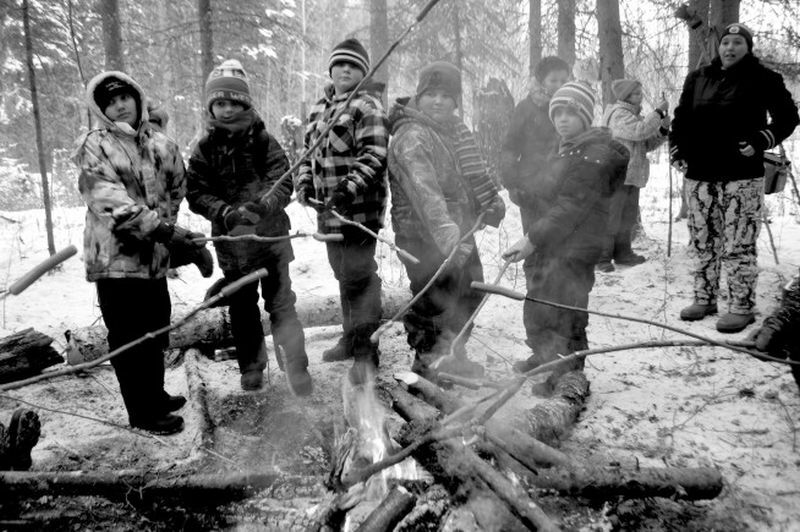 Students in separate classes at High Prairie Elementary School spent a day in the cold at Sucker Creek Cree Nation on Jan. 15-16. The next day, students at Joussard School took part in the program. 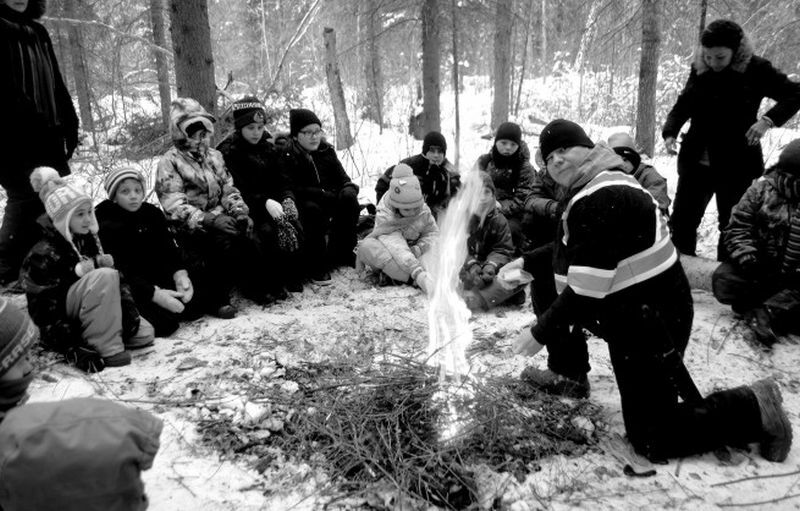 High Prairie School Division introduced the program called land- based learning. “Land-based learning has been active in the school division for three years,” says Diane Bellerose, Indigenous support lead for HPSD. Sucker Creek is participating in its first year in the program, she adds. HPSD Indigenous success coach Joyce Hunt says the outdoors provide vast opportunities to learn. “This is nature’s first classroom, being outdoors,” Hunt says. She says Indigenous people know how to use the natural elements of trees, shelters, fires, the sun, moon and stars. Students learned the basic skills to survive if they got lost or stranded in a remote area. Sucker Creek Elder Ron Willier was the main teacher for the students. “This is a lesson if you do get lost in the bush,” Willier says. “If you get lost, build a shelter and a fire and find lots of fire wood and gather your stuff before night falls,” Willier says. 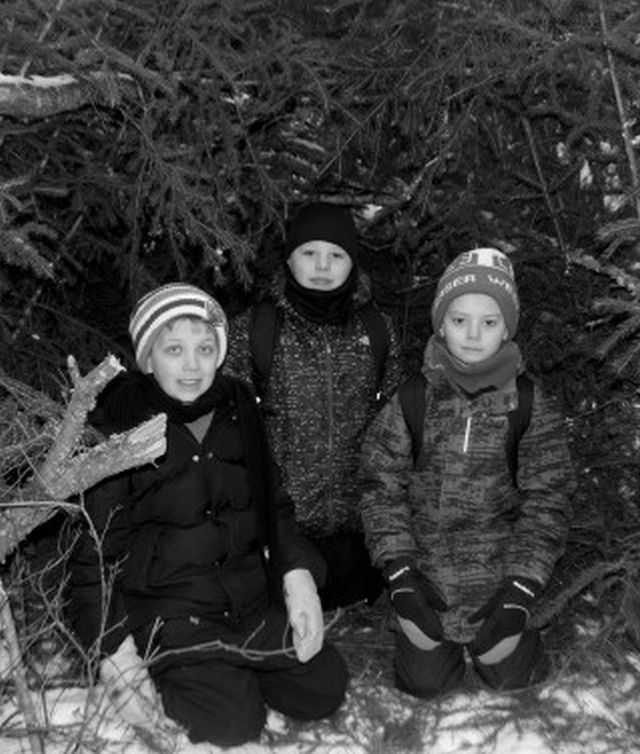 Boys in Brenda Coulombe’s HPE Grade 5 class sit inside a shelter made of trees, boughs and branches. Left-right, are Dag Sware, Jonathan Calhoon and Ethan Warren-Currier. Sucker Creek Cree Nation Elder Ron Willier shows students that moss on trees grows more on the northern side. Students left-right, are Tristen Grant, Noah Farnell, Hannah Vance and Felicia Noskiye. Students in Brenda Coulombe’s HPE Grade 5 class take their turn at building a shelter with trees, branches and boughs. Left-right, are students Abby Bilyk, Liam Lamason and Elder Ron Willier. Students in Brenda Coulombe’s HPE Grade 5 class roast hotdogs around the campfire for lunch. Left-right, are Kali Siegfries, Ethan Warren-Currier, Noah Farnell, Davin Greene and Dag Sware.